[The leading Pharisees replied to Nicodemus,] "Are you from Galilee, too? 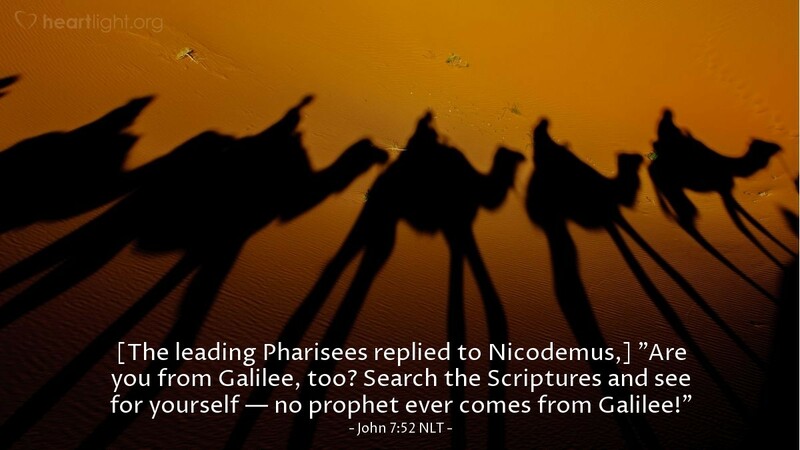 Search the Scriptures and see for yourself — no prophet ever comes from Galilee!" One person against a group seldom wins the short-term battle. If the group has the wrong information, its conclusion will be wrong no matter how many people speak in support of that conclusion. Rather than trying to deal with the truth of Nicodemus' statement, the rulers of Israel used a slur against Galileans and wrong information about Jesus' city of origin to shame Nicodemus. However, Nicodemus was right, and they were wrong. Nicodemus was a seeker, and they were satisfied with their status quo. Nicodemus stood for truth, and they wanted to stay comfortable. We must always put our conclusions up to the test of truth. Simply because a lot of other folks agree with us does not make our position right. Perhaps it even ought to make us a little bit suspicious. When Jesus enters into a situation, he nearly always shakes up the status quo and tears down unquestioned traditions. Let's NOT be like the religious hypocrites of Jesus' day who loved their positions, their teachings, and their cronies more than they loved the truth and the one who embodies that truth. Father, forgive me for the times that I have shut my heart to the radical truth of your righteousness, justice, and mercy because I found myself comfortable with my own religious position. Please keep alive in me the heart of a seeker — a truth-seeker, a people-seeker, a Jesus-seeker. Conform me to be more like Jesus and less like the religious hypocrites of Jesus' day. In Jesus' name, I pray. Amen.